Blowout Sale! 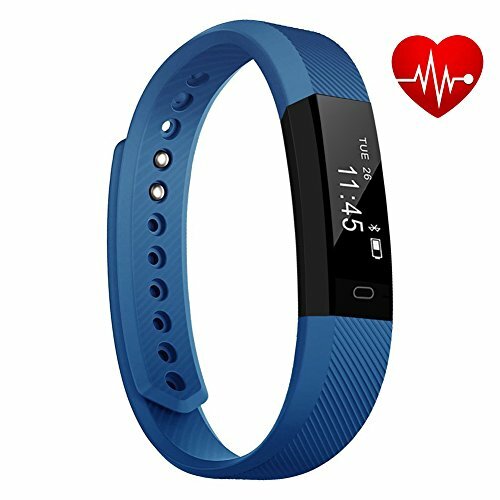 Save 61% on the TopBest Fitness Tracker Bluetooth Call Remind Remote Self-Timer Slim Smart Bracelet Calorie Counter Wireless Pedometer Band Sport Sleep Monitor Activity Tracker for Android iOS Phone by ANCwear at Cardio Fitness Plus. MPN: HRID115blue. Hurry! Limited time offer. Offer valid only while supplies last. 【Activity Record】 Record daily calories,distance,quantity,count,step pedometer,activity duration. 【Sleep Monitor】 Automatic monitoring sleep duration and sleep quality,sleep can view the trend to improve sleep,and through the vibration alarm clock wake you quietly. 【Notification Remind】Intelligent notification be clear at a glance,convenient and timely access to telephone,SMS and all kinds of social information. Through touch button began to ring view information content. Sedentary reminder,remind you to leave the seat for just the right amount of exercise. 【Anti-lost and Remote】When the smart phone is beyond the Bluetooth range(5m).The device vibrates to remind .Operation on the screen could control remote photography shooting. 【Built-in USB Charger】No charging cable needed. Fitness tracker can be removed off the strap and recharged from any 5V/1.0A USB power supply. Long-lasting battery: Just need to charge 1 hours and then you get a 7 days standby fitness tracker. If you have any questions about this product by ANCwear, contact us by completing and submitting the form below. If you are looking for a specif part number, please include it with your message.